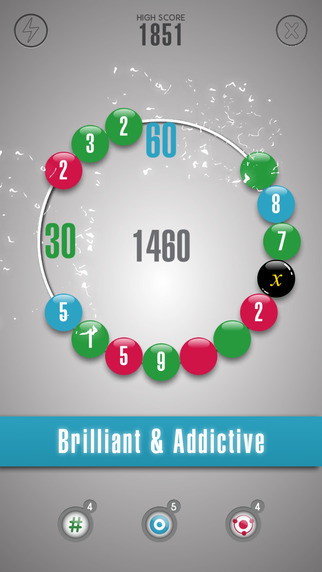 Enso - Brilliant Puzzle Game is the full title of this point scoring puzzle app game. The objective is to move the marbles around the circumference to get groups of 3 or more like colors to match. Example: a blue 7 can travel 7 spaces in either direction. The game ends when no more moves are possible. See the 3 icons at the bottom of each screen? One allows you to add numbers. Another: all the pieces swap places. The third: download it and find out. Enso - Brilliant Puzzle Game has a lot going for it. At the moment, the field of Point Scoring Apps is very crowded with very good games.